Desertification, the degradation of land in arid areas, is a growing problem due to deforestation, fires, and climate change. Magnus Larsson, a student at London’s Architectural Association has a drastic solution–a 6,000 km long wall of artificially solidified sandstone spanning the Sahara Desert from east to west. Dunes along Larsson’s sandstone wall will act as a combination of refugee housing and a block against the desert. It’s a big departure from current anti-desertification methods, including water conservation, soil management, forestry, sustainable energy, improved land use, wildlife protection, poverty alleviation. Larsson believes that the interior of the dunes along his sandstone wall could be used to achieve multiple goals at once–helping soil remain fertile, providing water and shade, and taking care of plants and animals. If it is ever constructed, Larsson’s sandstone wall could support the Green Wall Sahara initiative, which aims to plant a shelterbelt of trees across the African continent. i wish to learn this technology but how? I'd love to use this technology in the Adrar region of Mauritania to help with agriculture...when can I start? What a great idea! Creating sandstone, which is 10-20% CO2 by weight, would help make up for all that cement we use (3rd largest source of CO2 emissions). 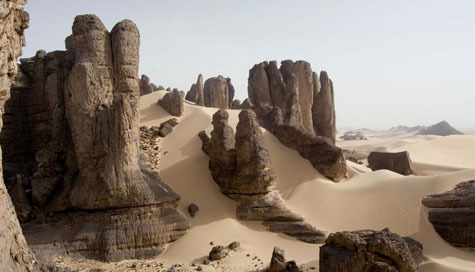 http://www.enn.com/top_stories/article/38127 Sequestering CO2 (10-20% by weight in sandstone) would be another great side benefit! reminds me of this movement: http://radio.weblogs.com/0119080/stories/2003/04/28/galleryTheClassicRockRealm.html most especially roger & martyn dean's housing designs. Desertification, the degradation of land in arid areas, is a growing problem due to deforestation, fires, and climate change. Magnus Larsson, a student at London's Architectural Association has a drastic solution--a 6,000 km long wall of artificially solidified sandstone spanning the Sahara Desert from east to west. 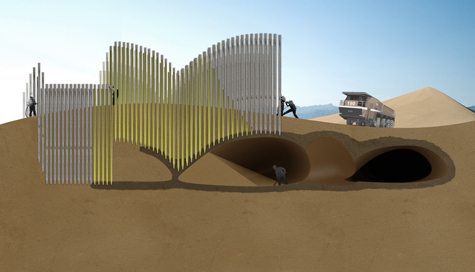 Dunes along Larsson's sandstone wall will act as a combination of refugee housing and a block against the desert.